This digital showroom experience provided our client with industry-leading technology adoption, while maximizing sales conversion efficiency. For the customer, a premium kitchen remodel is akin to the purchase of a luxury auto. My team applied a first-of-its-kind technological strategy toward this ripe market. 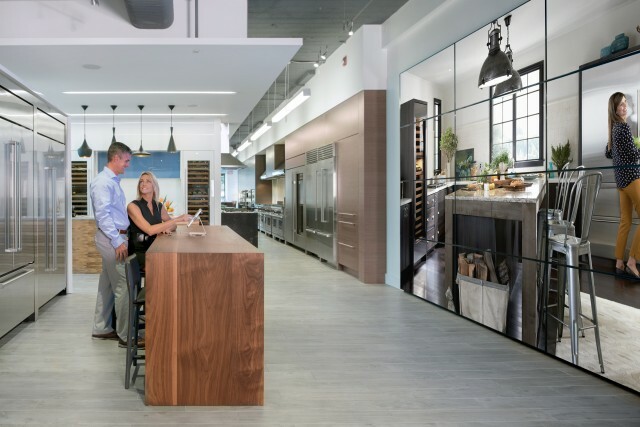 We built a life-size (1:1 scale) virtual environment for customers to intuitively configure and visualize their dream kitchen. Using the touchless interface of the Leap Motion sensor, the customer is able to design their kitchen through a futuristic “Minority Report” interaction. A permanent fixture in Kansas City’s upscale Plaza district, this digital experience positioned the client at the forefront of luxury innovation in their industry. This system provided a fun and intuitive user experience, while constantly collecting data on usage and on the customers themselves. By following the theory of “Gradual Engagement”, we were able to get customers further down the sales funnel more quickly. Additionally, the iPad app functions as a sales tool for showroom associates, allowing them to quickly reference and educate the customer about the large number of available product variations (7000+).